Membranes Australia installs a specialist range of roofing membranes for both commercial and domestic waterproofing. The bulk of our work is performed using Butyl Rubber waterproofing such as the Butynol range from Ardex Building Products. We have been installing Butyl Rubber in Australia Since 1978. Butyl Rubber waterproofing is used for both domestic and commercial projects of all sizes, ranging from small portico’s up to large factory and building roofs. Butyl rubber is suitable for high pitch and low pitch roofing and is suitable for maintenance only traffic areas. Butyl Rubber comes in a range of colours, mostly black or Grey. 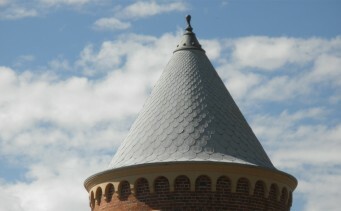 The flexibility of Butyl Rubber allows it to be used over any shaped roof surface, and it can be cut into shapes to simulate different tile or slate styles. Butyl Rubber is guaranteed for twenty years by both Membranes Australia and the material manufacturer. It has an expected service life of well over forty years. Although mostly used for below ground tanking, torch-on bitumen is suitable for flat roof installation. It can be used over most substrates and is particularly suitable for installation over existing bitumen or malthoid roofs which have developed leaks. Bitumen membranes are usually guaranteed for 10 years and have an expected service life of over fifteen. TPO membranes are a relatively new to Australia but have a history of over 20 years throughout the United States. Their light colour makes them excellent for heat reflection, and their low weight means they can be installed onto almost any surface. By using mechanical fixing methods, TPO membranes can be installed over insulation products which are incompatible with solvent based adhesives or flames. TPO Membranes are guaranteed for fifteen years, and have an expected service life of over 30 years. They fall between Butyl Rubber and Bitumen in quality and are mainly suitable for installation onto large spans.